Citation: Zhang Y, Ji F, Hao JG, et al. Two long-term follow-up cases about adefovir-induced hypophosphatemic osteomalacia. Case Rep Surg Invasive Proced. 2018;2(1):1-5. Adefovir dipivoxil, Chronic hepatitis B, Hepatitis B virus, Hypophosphatemia, Osteomalacia, Kidney dysfunction. Hepatitis B virus (HBV) infection is a severe public health problem all over the world. Chronic hepatitis B (CHB) is a chronic inflammation of the liver caused by the persistent infection of HBV. To our knowledge, CHB in humans may lead to severe liver damage, such as liver cirrhosis (LC) and hepatocellular carcinoma (HCC) . Therefore, it is essential to correctly treat the patients with CHB. So far, antiviral therapies include interferon (IFN) and orally nucleotide analogs (NAs). The most widely used antiviral regimen is orally NAs because of its advantages of high efficacy, ease of use, good tolerability. NAs include purine nucleoside and pyrimidine nucleoside drugs; their targets are reverse transcriptase (RT) and DNA polymerase (DNA-pol). Those two kinds of drugs can phosphorylate through Thymidine kinase (TK) in order to form three phosphate nucleoside analogs. Three phosphate nucleoside analogs can competitively combine with the DNA chain of RT and DNA-pol so that HBV replication and extension are inhibited. Adefovir dipivoxil (ADV) is a kind of purine nucleoside drug. Its molecular formula is C20H32N5O8P. It can reduce the amount of mitochondrial DNA (mtDNA) in cells by restraining human mtDNA polymerase-g, disrupting the oxidative phosphorylation processes, thus leading to cell damage. ADV is characterised by low cost, low drug resistance, and has been used widely in developing countries [2,3]. However, several papers reported kidney diseases in the proximal kidney tubule by using ADV with a low dosage (10 mg daily) and hypophosphatemic osteomalacia even the Fanconi syndrome [4-11]. Notice that their serum creatinine (Cr) and phosphorus (P) slowly became normal after stopping using ADV in above papers. We concluded that this damage of kidney function was reversible. However, we encountered two patients with HBV infection in whom the adefovir-related bone disease was diagnosed to be hypophosphatemic osteomalacia. From admission until now, we have been followed up. We notice that longterm use of ADV with a low dosage (10 mg daily) can also cause permanent kidney damage. A 22-year-old Chinese man was diagnosed as CHB in 1997. At that time, his liver function was normal. Since 2000 he felt tired. His liver function was abnormal (asparate aminotransferase (AST):108 U/L, alanine aminotransferase (ALT): 115 U/L). The HBV-DNA polymerase titer was 1.24E+05 copies/ml, and hepatitis B envelope antigen (HBeAg) was positive. He repeatedly used liver protective drugs to decrease transaminase. Though we recommended that he should start the therapy of anti-HBV, he always refused to use antiviral drugs. His fatigue was worse in January 2007, and viral replication was active (the HBV-DNA polymerase titer was 2.19E+06 copies/ml). Taking our suggestions into consideration, he began to use low-dose ADV (10 mg daily) to inhibit HBV replication in January 10, 2007. The HBV-DNA polymerase titer was below 1000 copies/ ml in June 12, 2007. HBeAg became negative in March 20, 2008. In June 2008, he started experiencing slight pain in the lumbar back, knees, and he could bear it. In February 2010, he was admitted to our hospital for an evaluation of severe pain in the lumbar back, knees, sacroiliac joint, ankle joint, toe joint, heels. Therefore, he had difficulty walking and standing. Generalized bone pain suddenly occurred without any precipitating cause and then worsened. He was advised to change to entecavir in February 3, 2010, and to utilize potassium citrate and calcium mixture. One month later, he was recommended to change to sodium phosphate dibasic. The generalized bone pain had been attenuated in May 7, 2010, so he could stand upright. The following figures show the change of the observations in a quite long time. AST, ALT was normal during the process of antiviral therapy. The serum alkaline phosphatase (AKP: 204 U/L, normal range, 42- 128 U/L) began abnormal since March 2008. The level of AKP continued to rise before stopping using ADV. He was advised to change to entecavir in February 3, 2010. AKP (109 U/L) has always been at a normal level from April 2012 (Figure 1). 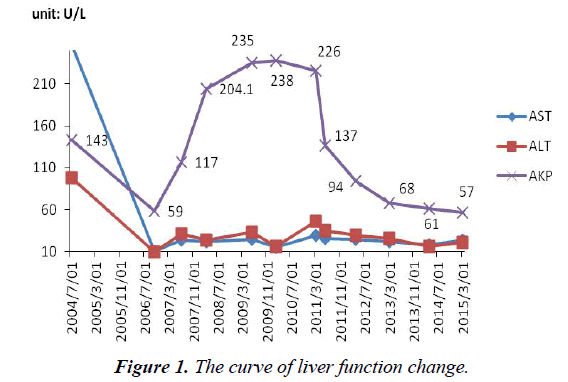 Figure 1: The curve of liver function change. The serum Cr was normal before using ADV. After using ADV 8 months, Cr (100 umol/l, normal range, 40-97 umol/l) became abnormal. 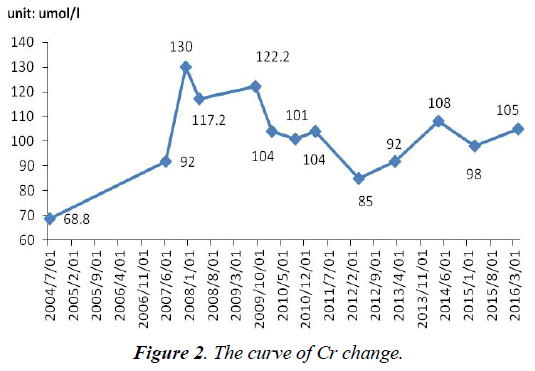 What was worse, since withdrawal of adefovir until now, Cr has not completely normal, fluctuated between 78 and 108 umol/l (Figure 2). Figure 2: The curve of serum P change. The serum P level was not monitored before admission. After admission, P level (0.41 mmol/l, normal range, 0.82-1.60 mmol/l) was lower than normal. On withdrawal of adefovir, the patient began to use potassium citrate and calcium mixture. One month later, he was advised to change to sodium phosphate dibasic. So, P level rose slowly and soon became normal temporarily in September 2010. But notice that P has not completely been normal, fluctuated between 0.6 and 1.32 mmol/l (Figure 3). i) Significantly abnormal uptake in the right second, seventh anterior ribs, right third posterior ribs, cervical spine; ii) Significantly uptake in both knee joint, ankle joint and sacroiliac joint: inflammatory? iii) "super bone imaging" sign (Figure 4). Figure 3: The curve of serum P change. Figure 4: Whole body bone scan. Neck, chest and abdomen showed no abnormal glucose metabolic syndrome (Figure 5). 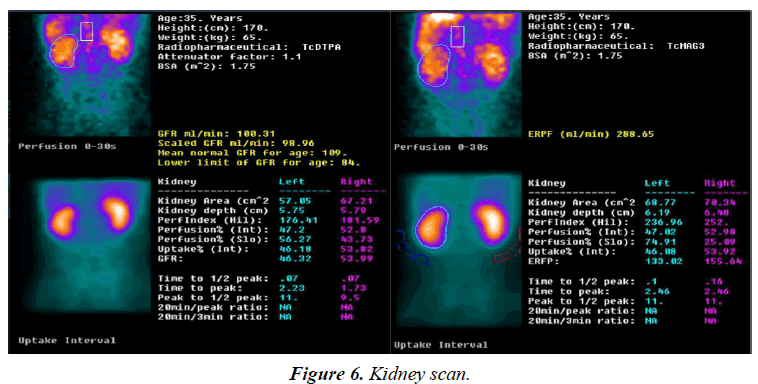 Kidney scan: i) the excretory function of kidney tubular was impaired; ii) the glomerular filtration function was normal; iii) the kidneys and bladder were normal (Figure 6). 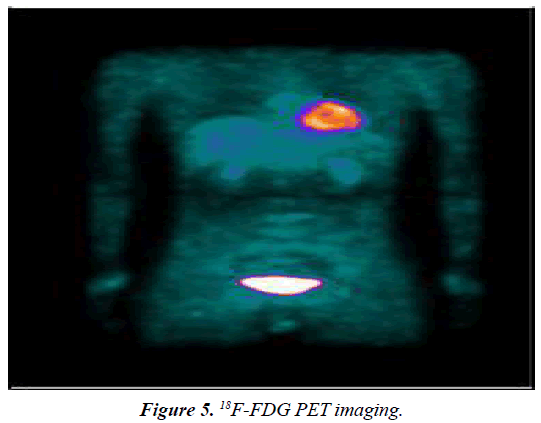 Figure 5: 18F-FDG PET imaging. Bone marrow cytology examination was normal. Rheumatoid factors were negative. The bone mineral density (BMD) decreased. Excluding blood system diseases, rheumatic diseases, and orthopedics diseases, we diagnosed this patient with adefovir-induced hypophosphatemic osteomalacia. A 50-year-old Chinese man was diagnosed as CHB in 1995. At that time, his liver function was normal. He had fatigue, yellow urine, and lost his appetite since 2003. His liver function was abnormal (AST: 98 U/L, ALT: 128 U/L). The HBV-DNA polymerase titer was 2.98E+05 copies/ml, and HBeAg was positive. We advised him to begin using drug to inhibit the replication of HBV, but he refused because of poor family economy. In March 10, 2006, the patient had lower extremity edema, severe fatigue, and abdominal ultrasound revealed: LC, ascites. The HBV-DNA polymerase titer was 2.03E+07 copies/ml. He chose to use low-dose ADV (10 mg daily) to start antiviral treatment. The HBV-DNA polymerase titer was below 1000 copies/ml in September 3, 2006, and HBeAg became negative. In 2010, he started experiencing slight pain in heels, and he could bear it. In June 2013, he was admitted to our hospital for an evaluation of severe pain in the heels. Therefore, he had difficulty walking, standing, and had poor sleep quality. Generalized bone pain suddenly occurred without any precipitating cause and then worsened. He was advised to change to entecavir in February 10, 2014, and to use potassium citrate, sodium phosphate dibasic and dibasic potassium phosphate. The generalized bone pain had been attenuated in April 20, 2014, so he could walk normally. The following figures show the change of the observations in a quite long time (the following observations were not monitored before admission). AST and ALT were normal during the process of antiviral therapy (not marked). After admission, AKP (130 U/L, normal range, 42-128 U/L) was abnormal. AKP (115 U/L, normal range, 42-128 U/L) remained at a normal level after stopping using ADV 2 months (Figure 7). 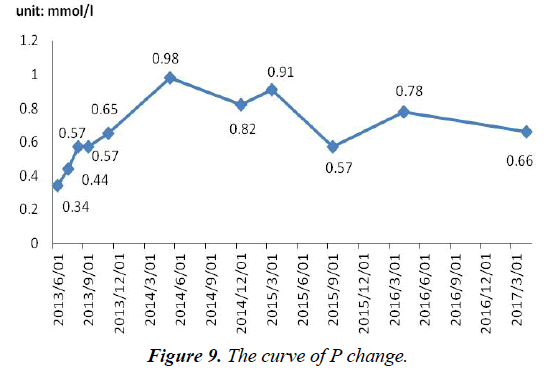 Figure 7: The curve of AKP change. After admission, Cr (101 umol/l, normal range, 40-97 umol/l) was abnormal. What was worse, since withdrawal of adefovir until now, Cr has not completely normal, fluctuated between 60 and 328 umol/l (Figure 8). 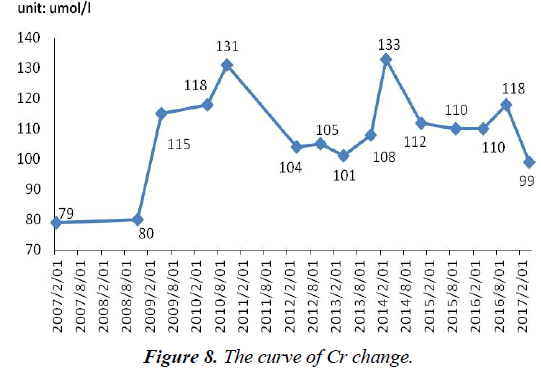 Figure 8: The curve of Cr change. After admission, P level (0.34 mmol/l) was lower than normal. On withdrawal of adefovir, the patient began to use potassium citrate, sodium phosphate dibasic and dibasic potassium phosphate. So, serum P level rose slowly and soon became normal temporarily in March 2014. Notice that serum P has not been completely normal, fluctuated between 0.57 and 0.98 mmol/l (Figure 9). Kidney scan: i) The excretory function of kidney tubular and glomerular filtration function were impaired; ii) the kidneys and bladder were normal. Figure 9: The curve of P change. Rheumatoid factors were negative. BMD decreased. In conclusion, we diagnosed him with adefovir-induced hypophosphatemic osteomalacia. The nephrotoxicity of adefovir is both dose- and time-dependent. Nephrotoxicity manifesting was frequently reported when higher doses (60-120 mg/day) of adefovir were used to treat the person who was infected with human immunodeficiency virus (HIV) in the past . However, several papers reported kidney diseases in the proximal kidney tubule by using ADV with a low dose (10 mg daily) and hypophosphatemic osteomalacia even the Fanconi syndrome [4-13] From these reports, we know that their kidney function injury could return to normal after stopped using ADV about 6 months, and kidney function is usually reversible if therapy is stopped timely. So far, the mechanism of adefovir-induced hypophosphatemic osteomalacia is not completely understood. To our knowledge, adefovir enters proximal tubular epithelial cells mainly through human organic anion transporter1 (hOAT1), situated on the basolateral membrane [13,14]. It is then secreted into urinary lumen by multidrug resistance protein 4 (MRP4; a member of the ATP-binding cassette transporter family) located on the luminal membrane . Furthermore, accumulation of adefovir may be harmful for mtDNA replication and the ATP-generating system in proximal tubular epithelium because of its inhibitory effect against mtDNA polymerase [16-18]. An important difference between our report and previous studies is that the damage of kidney is irreversible. From the kidney scan of these two patients, we can conclude that the early damage of kidney function is kidney tubular dysfunction. It mainly shows the damage of kidney tubular about the excretory and reabsorption function. This is mainly manifested in the serum Cr and P. The level of serum Cr with these two patients has not completely been normal since withdrawal of adefovir until now. Serum P were lower than normal after using ADV. After using sodium phosphate dibasic, serum P level rose slowly, but the level of serum P have not been completely normal too. From 8 years of follow-up with these two patients, we know that long-term use of ADV can cause kidney tubular and the glomerular filtration function damage, even permanent damage. But the specific mechanism about permanent kidney damage is not clear, whether individual differences or long-term use of ADV caused chronic kidney injury. In the process of long-term using ADV, we suggest that a close monitoring of electrolyte (phosphate, and calcium) and kidney function (serum creatinine, creatinine clearance, phosphate and urine analysis) is essential. We should monitor them at baseline and every 3 months with treated patients. Taking the side effects of ADV into consideration, telbivudine or entecavir is recommended for high risk CHB patients with kidney impairment. The aim of this article is that clinical workers should pay more attention to CHB patients with the long-term use of ADV. Zhu H, Wu J, Shen X. Genome-wide association study: New genetic insights into HBV/HCV-related hepatocellular carcinoma genomes. Scand J Gastroenterol. 2017;52:209-15. Chen Y, Ju T. Comparative meta-analysis of adefovir dipivoxil monotherapy and combination therapy of adefovir dipivoxil and lamivudine for lamivudine-resistant chronic hepatitis B. Int J Infect Dis. 2012;16:e152-158. Han SH. Natural course, therapeutic options and economic evaluation of therapies for chronic hepatitis B, Drugs. 2006;66:1831-51. Izzedine H, Hulot JS, Launay-Vacher V, et al. Renal safety of adefovir dipivoxil in patients with chronic hepatitis B: two doubleblind, randomized, placebo-controlled studies. Kidney Int. 2004;66:1153-8. Tanaka M, Setoguchi T, Ishidou Y, et al, Pathological femoral fractures due to osteomalacia associated with adefovir dipivoxil treatment for hepatitis B: A case report. Diagn Pathol. 2012;7:108. Kim DH, Sung DH, Min YK. Hypophosphatemic osteomalacia induced by low-dose adefovir therapy: Focus on manifestations in the skeletal system and literature review. J Bone Miner Metab. 2013;31:240-6. Kim DH, Lee SW, Kweon YO, et al. Bone scintigraphic findings of hypophosphatemic osteomalacia associated with adefovir therapy: Involvement of lower extremity skeletons. Clin Nucl Med J. 2013;38:378-80. Jung YK, Yeon JE, Choi JH, et al. Fanconi's syndrome associated with prolonged adefovir dipivoxil therapy in a hepatitis B virus patient. Gut and Liver. 2010;4:389-393. Minemura M, Tokimitsu Y, Tajiri K, et al. Development of osteomalacia in a post-liver transplant patient receiving adefovir dipivoxil. World J Hepatol. 2010;2:442-446. Lee HJ, Choi JW, Kim TN, et al. A case of severe hypophosphatemia related to adefovir dipivoxil treatment in a patient with liver cirrhosis related to hepatitis B virus. The Korean J Hepatol. 2008;14:381-86. Izzedine H, Kheder-Elfekih R, Housset P, et al. Adefovir dipivoxil-induced acute tubular necrosis and Fanconi syndrome in a renal transplant patient. AIDS (London, England). 2009;23:544-545. Fisher EJ, Chaloner K, Cohn DL, et al. The safety and efficacy of adefovir dipivoxil in patients with advanced HIV disease: A randomized, placebo-controlled trial. AIDS. 2001;15:1695-700. Cihlar T, Lin DC, Pritchard JB, et al. The antiviral nucleotide analogs cidofovir and adefovir are novel substrates human and rat renal organic anion transporter 1. Mol Pharmacol. 1999;56:570-80. Cihlar T, Ho ES, Lin DC, et al. Human renal organic anion transporter (hOAT1) and its role in nephro- toxicity of antiviral nucleoside analogs, Nucleos Nucleot Nucleic Acids. 2001;20:641-8. Imaoka T, Kusuhara H, Adachi M, et al. Functional involvement of multidrug resistance-associated protein 4 (MRP4/ABCC4) in the renal elimination of the antiviral drugs adefovir and tenofovir. Mol Pharmacol. 2007;71:619-27. Cherrington JM, Allen SJ, McKee BH, et al. Kinetic analysis of the interaction between the diphosphate of (S)-1-(3- hydroxy-2-phosphonylmethoxypropyl) cytosine, ddCTP,AZTTP, and FIAUTP with human DNA polymerases beta and gamma. Biochem Pharmacol. 1994;48:1986-8. Brinkman K, ter Hofstede HJ, Burger DM, et al. Adverse effects of reverse transcriptase inhibitors: Mitochondrial toxicity as common pathway. AIDS. 1998;12:1735-44. Tanji N, Tanji K, Kambham N, et al. Adefovir nephrotoxicity: Possible role of mitochondrial DNA depletion, Hum Pathol. 2001;32:734-40.